When or if you do a DNA Family Tree there are many factors to consider as to how and why in the form of goals you hope to achieve. the Merrick - Myrick - Meyrick lines of the descendants of the surname to document lineage, history and information for future generations. not just through marriage, but through common DNA ancestors. grandparents and common ancestors a I had. 100% Israel Hebrew DNA My Mother's line. This is unique in my sample in that my Father's Sister married my Grandmother's Brother. Let me explain. the same GREAT GRANDPARENTS in the TROUT LINE on both sides of the famiy in this one branch. So my TROUT great grandparents appeared on BOTH SIDES of my Family Tree as THE SAME people. programing anomilies that get even the best of programs confused when mapping the genealogy. Howard Trout was a son of MT J1b Trout married Merrick the sister of my father. 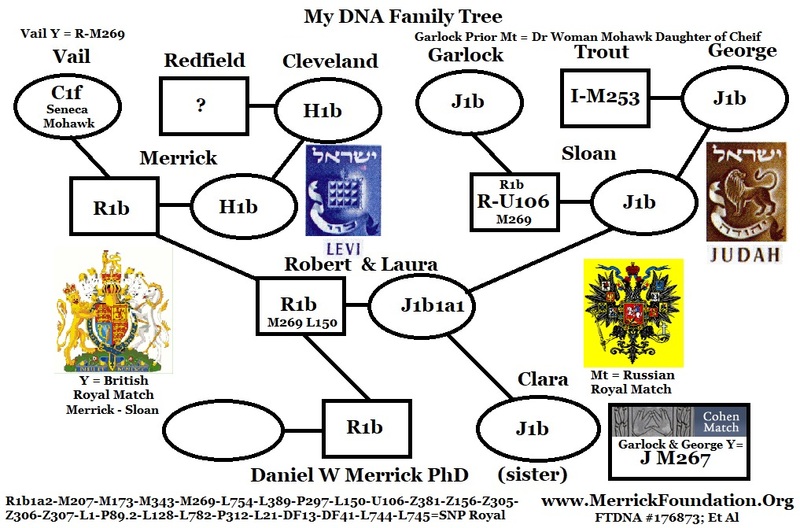 from the male Merrick line and H1b through the female Merrick/Redfield line. for HER was the same as my Y DNA father's Mother's Mt DNA in the tree which is H1b. her Y greatgrandmother. The R1b was a pre J1 line of levi according to Genealogy records. priestly biblical records as musicians and those who carried the tent of the temple. Y DNA MALE TROUT is I-M253 matches the J1 & R1b lines of migration. So my Y DNA is Merari son of Levi R1b My MT DNA is 106% J1b and 94% H1b out of 200% from my Dad's mother and my Mom's mother. That makes me about 76% Hebrew in origin by DNA. the Royal house of Yaraslov to the House of Rominoff and Stuart. 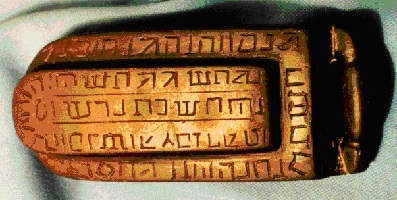 Jewish Royal lines of Rominoff were in fact Queens with J1b and J2 DNA. 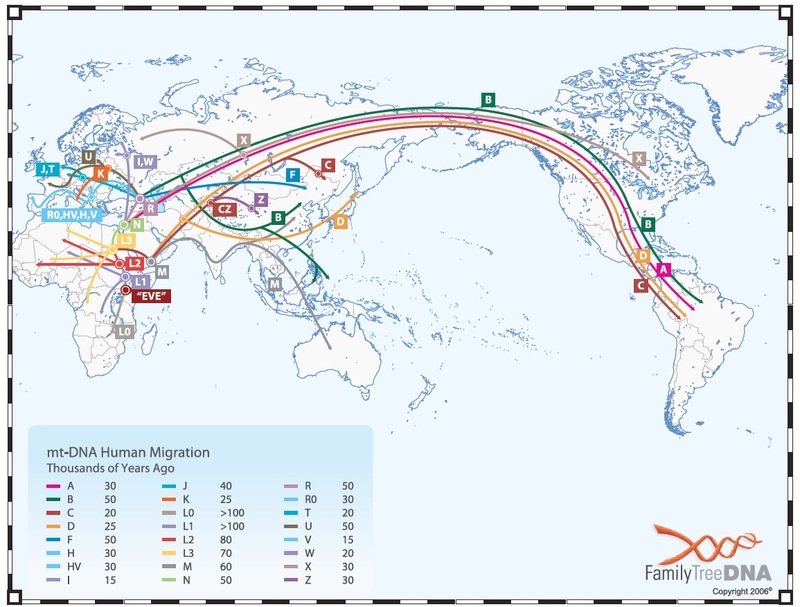 how and where our grandmothers which has the exact same DNA came to our DNA by origins. 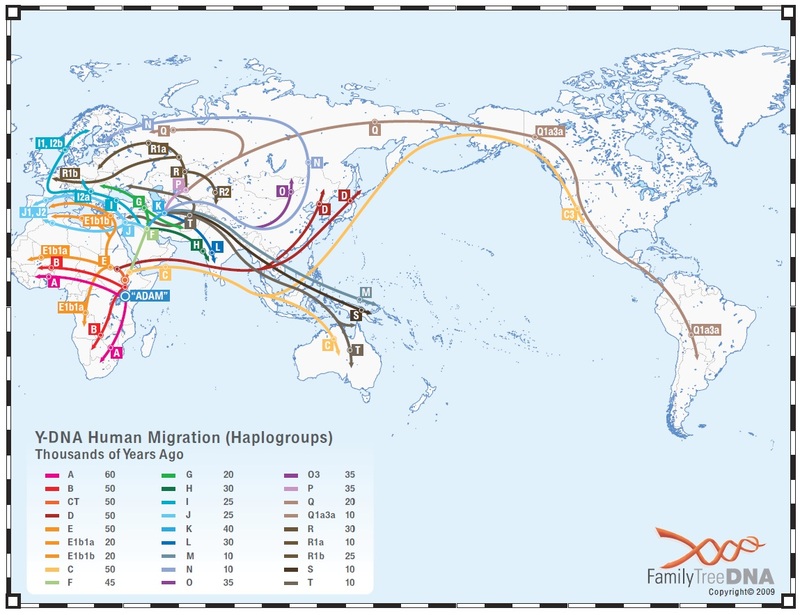 If we look at a Haplogroup migration map, we find that C branched off into F.
been proven by DNA and Historical artifacts found in Ohio, New Mexico and New York. this is all nice but what has it to do with my MERRICK DNA FAMILY TREE? bandages and discovered that every one came up positive for Coca and Nicotine. 1600s to 1800s had collected these mummies for the British Measuem. during the Egyptian Empire during the era of about 1300 BC or BCE. suppressed because it did not fit the "EXPERTS" and their version of History. later migrations. So to prove it we needed PURE DIRECT LINES to test. mixtures with the roots of L, N and H in Egypt. DR DAVIS suggested, made history long before the history books reported it in error. with each SNP positive showing both Royal and Hebrew Roots (Middle East). confirmed by matching markers to the house of York and Windsor. Paternal Grandmother is H1b showing the line from Alexandra and Phillip with Maternal J1b from line of King David. Mt matching shows Romanov and British lines of royalty with Hebrew roots. DNA on both Y and Mt lines are in fact Royal lines and can be traced back to the same line as Matthew the Grandfather of Yahshua more famously known as Jesus. In the Mother's lines to the House of Romanov and the house of King Edward and Phillip in the H1b and J1b lines. The Key DNA Mt markers are in bold above. the L23 line is the Leviticus line which is in Y DNA from the house of Merari and Aaron from middle eastern Hebrew genetic code. The House of Windsor, Stuart and York as well as Mountbatten House of Oldenberg that spawned the Romanov and Germanic lines of Welsh and British monarchs all have the markers M343, M269, with U106 unique to the Windsor and Oldenberg line with P312 and L745 to the Stuart line. Haplogroups include R1b, H1b, J1b and I with I-M253 being the Royal Germanic with J-M267 being the Royal Jewish. This tree has also the C1f lines of Royal American Natives in the Seneca and Mohawk tribes. 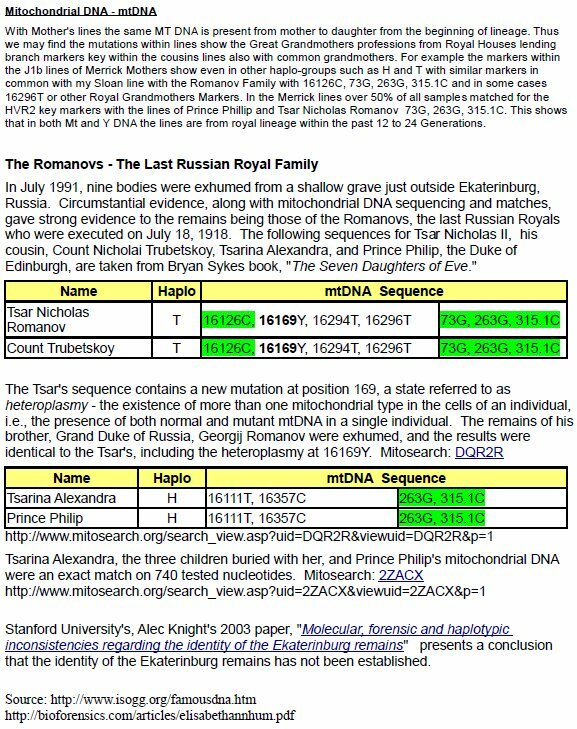 The Romanov also has T and is not found as of yet in this line be the Mt Markers show the same HRV1 and HRV2 markers from the H1b lines verified by Royal DNA testing. It has been verified the the unique R-Z375 is of Welsh origin to the direct lines of genealogy of King Llewellyn of Wales and King Charlemagne.This line also includes in the DNA family tree the SLOAN R-U106 that spawns the expression among royal lines as to who is royal be reference to their being "A Sloan". CRAWFORD, SLOAN, MYRICK, MEYRICK, MERRICK, MERRITT and are classified under the codex or soundex of surnames as having at least one ancestor from M620 phonetic designation. M620 in not to be confused with and DNA marker but only the varied phonetic spellings of the names of lines associated to the surname family tree groups. It is the educated opinion of the experts in genetic science of the family tree of mankind, that this DNA test is evidence of a long line of Hebrew and European Royal lineage that spawns by certified genealogical sources back for over 2000 years to many branches that had crown houses from many branches of the human family tree. same Y DNA DYS for Royal lines, we must conclude that these are Cousins with common ancestors. where our complete lines came from and who are historical ancestors of our grandparents and us. tribe of DAN and other markers seem to suggest a match with SIMION or other tribes of Israel. but historical evidence of the origins of each line by DNA that traces back to the original tribes of Israel and America. our ancestors and can harvest from history their stories which fill volumes at the library. lands which remain today in Seneca New York during the late 1700s to early 1800s. of the romance that was our Grandparents. French forces under Louis the 14th of France in 1688-1689 took power of the Palatinate (Rhineland) and forced the German inhabitants out. The Palatine refugees fled the Rhineland to Holland. Hans Gerlash was about 58 years old and his wife Anna Marie Kummer was 54, John Christopher about 17. John Christopher changed his name to Garlock. In about 1700, John Christopher married Ann Margaret. Their children were born in 1701 (Ann Margaret), 1702 (Elias), 1704 (Theabold). They were in Holland from about 1690 to 1708. In 1708, Queen Ann of England allowed about thirteen thousand of the refugees to emigrate to England where they were housed in refugee camps around London. At that time the English Navy needed tar for ship repair and construction. Governor Hunter of New York was advised that trees along both sides of the Hudson River would yield the pitch needed to produce the tar and this information was sent to Queen Ann. The Queen assigned Dutch Clergyman Donnie Kocherhal to promote the idea of sending refugees to America to work the pitch and tar project for England. The refugees would pay for their passage by working on the project. About 3,000 people volunteered, including the four brothers (four of the seven children of Hans Gerlash), Conrad Gerlash, John Christopher Garlock, Peter Gerlash and David Carlash and their families. In January, 1710, five ships of total 12 set sail from England with the 3,000 Palatines aboard. Two of the five ships and 470 immigrants were lost at sea. In June, 1710, the remainder reached New York. Another 250 died of fever after arrival. Governor Hunter’s New Your refugee camp ration list included John Christopher and wife and 9 year old daughter and two sons. Camps were established along the Hudson River to extract the pitch from the trees. John Christopher Garlock was placed in the West Camp and later was made master of Garachdrop camp as a series of small camps to the north were established. When the first pitch arrived in New York Camp it was discovered that the trees from which it came were of the wrong variety and the project was a failure. Governor Hunter decided not to provide for the 2,000 refugees and they were left to fend for themselves. The winter of 1712-13 was difficult, and in 1713, Queen Ann allowed them to move to Indian land. The refugees cleared the land, built homes, and began to prosper. Queen Ann decided to give them the land and sent Nicholas Beyard with the authority to give land grants to the refugees. The refugees did not understand Beyard, were suspicous of him, and tarred and feathered him. Beyard then gave the land grants to others and the Palatine Refugees were again homeless. John Christopher, now 50, and a small group of men crossed the Catskill Mountains into the Mohawk Valley. Sometime between 1713 and 1719 John Christopher’s wife and daughter were lost. John Christopher married an 18 yo Mohawk referred to as Doctor Woman. John Christopher and Doctor Woman had five children, all born in Stone Arabia, Mohawk Valley, in the Colony of New York. They were Elizabeth born about 1720; Nicholas about 1724; John Hans about 1730; Philip, 1732; and John Adam, about 1733. John Christopher’s was 63 when his last child was born. John Christopher and 27 other men obtained a patent land grant for 12,700 acres located north of the Mohawk River, about half way across Montgomery County and including part of Fulton County, as found on the map today. 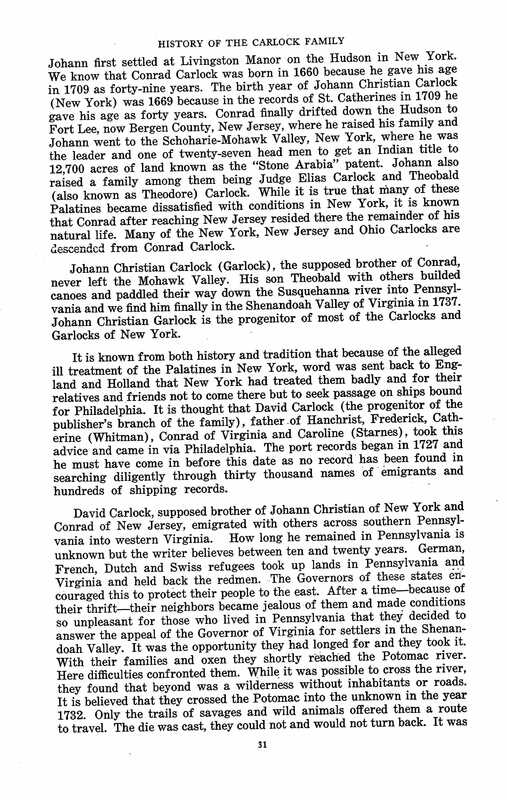 He died at about the age of 92.John Hans Garlock, the 3rd child of John Christopher and Doctor Woman, was born about 1730. In his early twenties he married an Indian woman “Brown Eyes” and settled in Palatine, Montgomery County, New York. They had four children, all sons; John, born about 1750; Abraham, about 1752; William, about 1754; and Stephen, about 1756. During the American Revolutionary War, John Hans in his forties and his four sons, John, Abraham, William, and Stephen served in Captain House’s Company, Clyde New York Regiment. came to place in me a legacy of DNA that seemed inconsistent with bias and prejudice that would be expected in the lines of British immagrants. found a branch not included in the make op of Who is Who and Who is allowed to gain power and position in society, it was better left unspoken. and emplyment in the era of the late 1700s and 1800s in America. So when we dig a littel deeper into the wills, diaries and recorded history we find a love story that shows how two people most unlikely feel in love. as the Post Revolutionary government drove most of the Seneca to be displaced from their native lands. The Seneca are a group of indigenous Iroquoian-speaking people native to North America who historically lived south of Lake Ontario. They were the nation located farthest to the west within the Six Nations or Iroquois League (Haudenosaunee) in New York before the American Revolution. the Seneca Nation of New York, with two reservations in western New York near Buffalo, and the Tonawanda Band of Seneca Native Americans. The Seneca-Cayuga Nation is located in Oklahoma, where their ancestors were relocated from Ohio during Indian Removal. of Seneca who resettled there after the American Revolution, as they had been allies of the British and forced to cede much of their lands. So we find in the VAIL line also that Letta a direct DNA mother to my lineage has C1f Haplogroup DNA. Vail Haplogroup is C1f showing Native American Seneca match in DNA tracing back to six generations. having Native roots in America. Thus I find Native roots on both sides of my Family DNA Tree which lead me to this publication of the facts. where to look for her story. to her white family with the unknown origins of the grandchild accepted in the knowledge of her father, their son's, death in battle. Peral B Vail. That DNA is Haplogroup C1f showing her Native roots coming from America to England and then back again. ships records and war records that proved Letita's origins and her father's death in the wars from that era. Once we access the British War Records we can trace who he was and fill in the family genealogy tree to reflect his origins. though cousins is found to be an extended likely place to find a spouse and return to America which is what happened. generations. Although white in appearance after 5 generations, the roots remain in the DNA Family Tree. by the Vail line in my father with the same C1f DNA haplogroup from Seneca Mohawk of the six nations Native American. So my Royal line has been here in America for 381 years in 2017 yet my Family ancestors have been here since about 1500 BC to 1300 BC. of about 3500 years since the Jewish people came on sailing ships from Egypt to obtain the plants used in the mummification process.